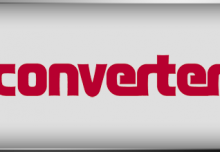 The company’s extrusion coating product line offers a comprehensive equipment offering from a singlesource supplier to address basic applications all the way up to high-speed, complex requirements. Systems are engineered for everything from high-quality flexible packaging, thermal lamination and stand-up pouches, to lidding, tube, and aseptic films. Specifications can be customized based on market requirements and investment plans. In liquid coating, Davis-Standard’s curtain slide coater and five-roll silicone coater combine versatility with performance. 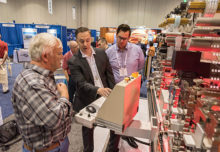 The curtain slide coater applies single layer coatings at rates up to 2800 fpm (853 mpm) with expansion capabilities up to two additional layers. The five-roll silicone coater is capable of applying 100 percent silicone at rates up to 2400 fpm (732 mpm). This coater is constructed of stainless steel for ease of cleanup and includes a mist removal system. Davis-Standard supports liquid coating for slow or high-speed applications, clean room environments, film or paper substrates, ultra-thin and ultrathick coatings, and precision coating and drying. In cast film, Davis-Standard offers a stretch film line that redefines modular efficiency for high-grade film operations. This technology is the new standard for stretch film line configurations. Advantages include a compact machine arrangement, ease of operation and servicing, excellent profile control, consistent roll quality and an intuitive control package. The system is engineered for producing thin films from 31-to 51- gauge (7.8μ to 13μ) at high speeds. Davis-Standard’s side-by-side DS S3 overlapping winder is essential to this capability. The DS S3 winder enables maximum slit widths for hand-wrap, machine-wrap and jumbo rolls. 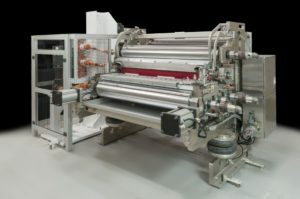 All rolls are discharged on the downstream end of the winder and are conveyed to a common side of the line to simplify roll packing and future automation. Cores are also same-side loaded from the back to prevent disruption of packing activities. There is an auxiliary lay-on roll to eliminate top-wind waste during transfer, optimizing roll quality and eliminating outer wrap transfer waste. High-volume core bins minimize refilling frequency and feature a simultaneous core-set discharge of multiple core lengths to decrease cycle times, improve slitwidth flexibility and net film utilization. Core widths can also be changed on the fly to maximize uptime. 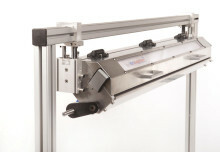 There is a 30-second cycle time regardless of the number of slit widths, ideal for hand-wrap products. Davis-Standard also supplies downstream and terminal equipment as well as MDO’s, oscillating hauloffs, and winders to optimize web handling and output goals. These solutions can accommodate standard applications as well as complex substrates and structures requiring precise tension control to ensure quality while minimizing waste. Automation options are available to reduce cycle time and augment benefits from increased outputs.